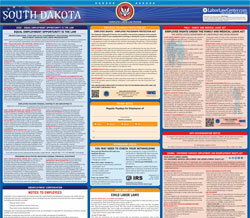 The Unemployment Posting (Spanish) is an unemployment law poster by the South Dakota Department Of Labor and Regulation. This is a mandatory posting for all employers in South Dakota, and businesses who fail to comply may be subject to fines or sanctions. This Spanish-language poster must be posted in a conspicuous place by all employers so that all employees can see it. This poster describes how to qualify for unemployment and where to file a claim for unemployment insurance benefits. It appears you don't have a PDF plugin for this browser. Please see the link below to download south-dakota-posting-notice-to-employees-spanish.pdf. Cumplan con ciertos requerimientos de la elegibilidad. sean eliminados o suspendidos por mala conducta, o se rehúsen a aceptar un trabajo aceptable. Departamento de Trabajo y Regulaciones que se enumeran a continuación. PO Box 4730                         lugar visible de esta tarjeta.